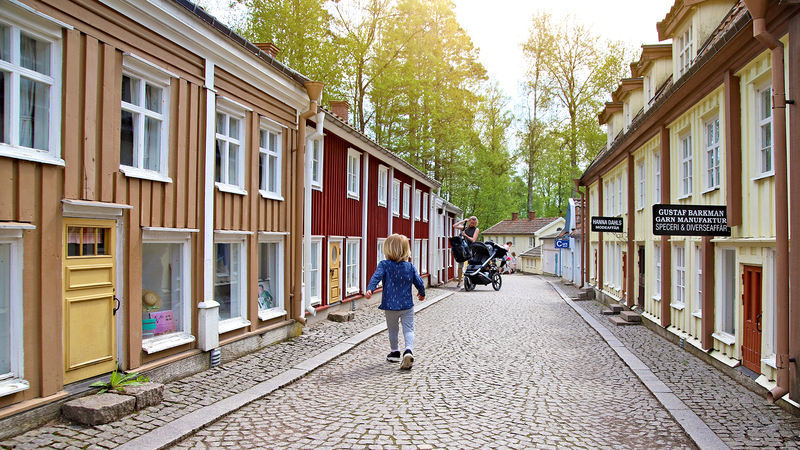 This is what the small town of Vimmerby looked like when Astrid Lindgren grew up there at the beginning of the century. In many of her books there are small town settings that take their inspiration from her childhood town of Vimmerby. Here you’ll find the shop where Pippi bought 18 kilos of sweets, Båtsmansbacken where Kalle Blomkvist sneaked around, Borgmästargården where Emil rode in on Lukas in the middle of a party, the hotel garden pavilion where Mardie attended the mayoress’s autumn ball and Alva danced with the chimney sweep, and the square where Brenda Brave sold her peppermint rock. Next to the Big Square, two aid organisations, which we work with, are represented – Save the Children and SOS Children’s Villages. In their houses, they describe their work to help vulnerable children in different ways. There is also information on how you can support their work. In the house for SOS Children’s Villages, there is also a very nice model of the first Astrid Lindgren children’s village, which was built in Bouar in the Central African Republic as a result of a collection made in connection with Astrid Lindgren’s 100-year jubilee. The same house also has a presentation of our next project together – SOS Noisy Village – a new children’s village in Busangoa also in the Central African Republic.